The Legacy of Billy and Mary continues on with their children, and now grandchildren. Kory Nagler is currently living in Seattle in the University district, attending college at the University of Washington. Kory is currently expanding his knowledge of culture and history as he majors in World Religions. The hugely talented musician is still playing every instrument under the sun. He recently received a violin as a gift and is learning how to caress the strings. As passionate about Music as ever Kory has been recording new songs with a blues-y gospel flare that would blow you away. To help expand his knowledge of recording he is enrolled in an audio production program through the UW as well. He has brought a wonderful addition to our family, his girlfriend Rachel. She is a truly gifted artist, photographer and just a lovely individual. We are so lucky to have her! Casey Nagler is a college student at Western Washington University in Bellingham. Growing up in a family business might have influenced his choice of majors for he is currently a Business major. But it's not all business for Casey, as his curiosity and spiritual insight have led him to study religion as well and it will be his minor. He is a multi-talented performer still tickling the keys on the piano, as well as taking up the guitar and the harmonica this year. He loves making movies and has a huge collection of excellent comedies with a cast of great friends and family. You really should check out his latest masterpiece. It's a take of the late 80's star-studded fundraiser "We are the World". In this video Casey acts out every musician from Lyonel Richie to Willie Nelson with a flawless precision. 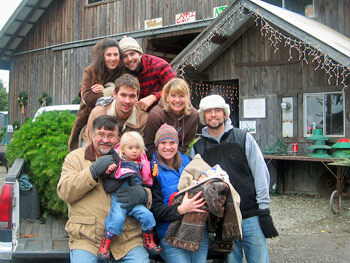 Nicole and Ross McCurdy love being able to call Sequim their home...for now. I Married Ross in 2003 to the delight of the family. Ross fits this family like a glove with his humor, wit and huge heart. Ross is a multi-talented ambitious individual. He has been making movies for years now and was a student at the Vancouver Film school, where he learned much about the movie business. He writes directs and stars in all his films. His colorful cast is found much inside our own family using Kory and Casey for lead rolls, as well as myself, Billy, and the crew from the Oak Table. Ross recently began doing stand-up comedy, one of his life long dreams and he does it beautifully. Ross and I are here learning every aspect of The Oak Table, from book work to batters. But by far the best thing I have done in the past few years is to make one of the most perfect individuals the world has ever seen. Mira Danger McCurdy is now 2 years old and is an amazing addition to this family. She is a bright shining star, smart and sweet! I have the best of both worlds being able to spend almost all of my time at home with Mira, and just 2 days a week at the restaurant working and learning the ropes for my own place.